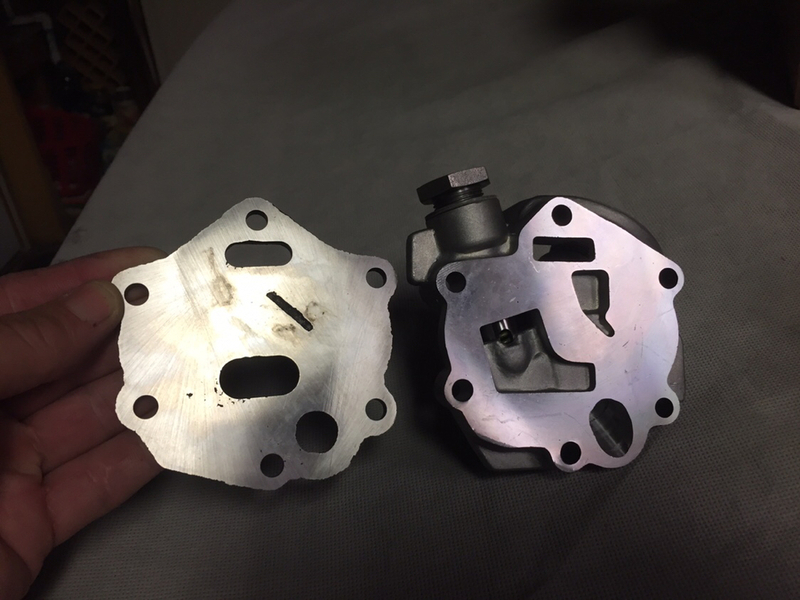 Any flow or pressure benefit of running a thrust plate over a polished flat oil pump cover? I understand the plate is so you wont need to polish out the groves but I was thinking of turbulence / cavitation caused at the relief port of the stock cover. Maybe GM engineers already thought of that and that's why the relief port is a funky hockey stick looking shape. I know the less gaskets the better so that's why I thought Id ask. Some of those features are there to act as a debris trap so the gears don’t chew up the thrust surface or worse lock up the gears. If the oil is perfectly clean it’s not an issue but you just can’t bank on that. That plate is a band-aid for a scored oil filter adapter. It's also a way to add two mismatches on the high pressure feed to the engine. (and double the odds of having a leak at the gasket(s) between the cover and the adapter. There's no performance gain to be had adding that under a smooth filter housing. That goofy line looking groove isn't a debris trap, it's a path for high pressure oil to wet the fixed pin they driven gear rides on. Plate is great and a way to keep the end play of of the oil pump gear in check. The gears WILL wear into the alum oil filter adapter and end play will increase. As far as leaks with the plate, Ive never had a leak and have built several front covers and FWIW so did/does Jim Ruggles, TA, DLS, ETC ETC and it wasnt a issue. Theres the booster style plate as well as a wear plate. No way I would build a oil pump without one! Over the years of messing with TR's ive pulled front covers off of cars with less than 25k miles as owners wanted peace of mine with the timing set being replaced and of course the oil pump was gone though. Always found scoring on the oil filter housing! Agree completely, but I would use a better plate(wink, wink) that's truely flat unlike the Melling one. Steve V's Automotive is a paying vendor, I will plug them for you! I've had the kenne Bell plate on one of my cars for 30 years. Same oil pressure at 200K miles as it did with 18K miles when I put it on there. I think there's was anodized aluminum. About the only place on my car that doesn't leak.